Well our traditional hot and humid summer weather has arrived in full force this week. Whilst I know that there are some people who like this weather, most of us don’t. A few weeks ago I wrote a blog about how to keep cool in summer which included some mention about ceiling fans. However for a number of reasons ceiling fans are a really cost-effective method of cooling, so I thought a blog about the advantages of ceiling fans may help anyone contemplating installing ceiling fans. The most obvious and greatest advantage of ceiling fans is the low running cost and the high effectiveness of ceiling fans in cooling our homes or places of work. Obviously ceiling fans are not nearly as effective at cooling as air-conditioning is, however they do beat air-conditioning if one was to examine the cost of both against the effectiveness. The fan below can be purchased from My Fan. When compared to air-conditioning, ceiling fans are dirt cheap. You can in fact get a ceiling fan from Bunnings for as little as $65! Compare this to their cheapest air-conditioner at $800. Ceiling fans as we all know cool us in summer by creating a breeze and increasing the evaporation of perspiration. 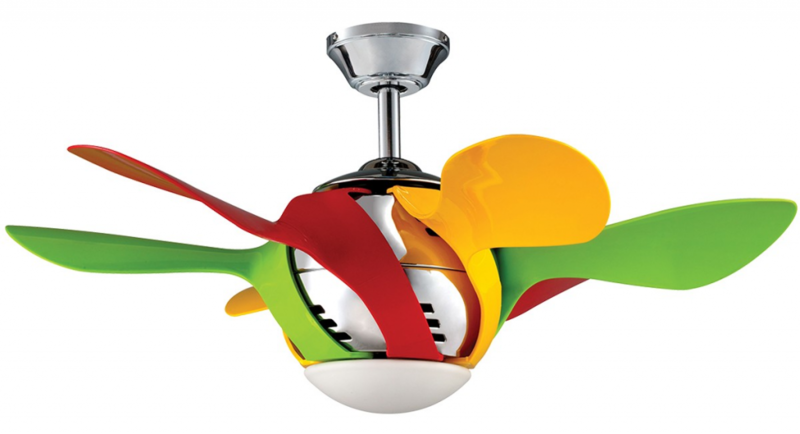 In summer the ceiling fans create a cooling downward airflow with the leading blades pointed up to move the air down and the fan rotating in a counterclockwise direction. Effective ceiling fans can make a room feel up to 6 degrees Celsius cooler. Thus a home can be kept quite cool even on a Brisbane summer day by the use of ceiling fans. Having a ceiling fan on means that one can set the air-conditioning to a higher temperature. This can save a great deal of money as each degree lower that an air-conditioner is set saves around 3% on your heating bill. Among the advantages of ceiling fans is that they are effective in winter as well. In winter, the setting on the ceiling fan should be changed so that the fan roates clockwise with the leading blades pointing down, this pushes the air at the top of the ceiling back downwards. As hot air naturally rises, this hot air becomes trapped at the top of the ceiling. However using a ceiling fan in winter will warm the room by pushing this hot air back down again. It has been estimated that the winter advantages of ceiling fans can be a saving of around 15% of energy costs. One of the really great advantages of ceiling fans is that they can be used outdoors as well. It would be quite silly to try and cool a deck, patio or pool side with air-conditioning. On the other hand ceiling fans are very effective outdoors, and I should know as we have two on our deck and in the heat of summer, our deck can be cooler than inside if we have the combination of both the ceiling fans and a cool breeze. When choosing ceiling fans for an outdoor entertaining area you need to make sure that you select a ceiling fan that has been designed to be outdoor and cope with the damp and outdoor wear. You will find that most retailers of ceiling fans have outdoor ceiling fans clearly marked for that purpose. If you like to sleep with the windows open and don’t have fly screens you will find that your ceiling fan is very effective in keeping mosquitoes and other flying insects away. Ceiling fans in kitchens and dining rooms are also really good at keeping those pesky flies away from food. Naturally in an outdoor area ceiling fans can really help with making outdoor living more comfortable by keeping insects away. Advantages of ceiling fans include that you can create a decorative statement with a highly functional and useful item (being the ceiling fan) in your home. 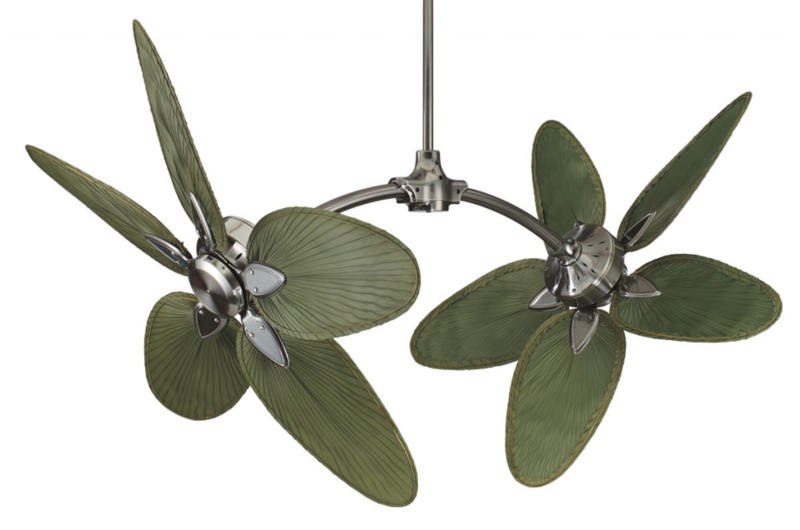 There are now some fantastic different designs and styles of ceiling fans from the ultra modern to the traditional. There are also some really large ceiling fans that are not only effective in an large area but really create a statement. The fan below is one of my favourites, supplied by My Fan. A normal installation of a ceiling fan is by far cheaper than having a air-conditioner installed. I do a lot of ceiling fan installations (probably because my website ranks high in Google for this type of work) and have thus got ceiling fan installation down pat. I am therefore able to install ceiling fans very quickly and effectively. Due to efficiency ie less time, it is therefore less expensive for you as a client to engage my services for your ceiling fan installation in Brisbane. Some ceiling fan installation jobs are more tricky then other. For example if the ceiling fan is installed in the lower level of a double storey home with no ‘roof’ access. Another example would be if there is no beam located where the customer wishes to have the fan installed. Whatever the tricky problem with ceiling fan installations, you can be sure I have already had to deal with them and will be able to sort yours out quickly too. I hope I have encouraged you, after reading this blog to go out and buy ceiling fans for every room in your home! If you do, and if you live in Brisbane, then give me (Justin) a call on 0433 209 393 and I would love to come and install your ceiling fans for you.